The Division of Orthopaedic Oncology offers expert care to children and adults diagnosed with tumors and tumor-like conditions of the bone and soft tissue, including bone metastases, sarcomas, benign and cancerous tumors of the bone or soft tissue and pathologic fractures. Drs. Carol Morris, Jonathan Forsberg and Adam Levin work closely with general surgical oncologists, radiation oncologists, adult medical oncologists, radiologists, pathologists and plastic surgeons to provide a multidisciplinary, coordinated approach to care for each patient. Meet our orthopaedic oncology specialists. We treat a range of cancers of the bone and soft tissue in both children and adults. Learn about our scientific advancements in the field of orthopaedic oncology. After 9-year-old Jaliyah was diagnosed with osteosarcoma, her mother searched for an option to save her leg from amputation. Carol Morris, M.D., M.S., offered an alternative — a complex limb-sparing surgery, which allowed Jaliyah to continue dancing. As experts in limb-sparing surgeries and complex limb reconstruction, such as rotationplasty, our orthopaedic oncology team focuses on both removing tumors and rebuilding affected limbs to provide patients with the most functionality possible. All medical specialties involved in successful limb preservation are located in one place, so that you don't have to travel to multiple locations. During initial consultations, patients are often able to see all of the physicians that will be involved with their care in a single visit. Because advancements in medical oncology are helping patients live longer with disease, they are more likely to develop new problems, such as bone metastasis and pathologic fractures. Our experts work with oncologists treating the primary cancer to offer a coordinated, seamless approach to care for our patients and help them maintain function and control of their body while managing their pain and quality of life. Sarcoma Treatment: Answers from Carol Morris, M.D. Approximately 15,000 people in the U.S. are diagnosed with sarcoma every year. 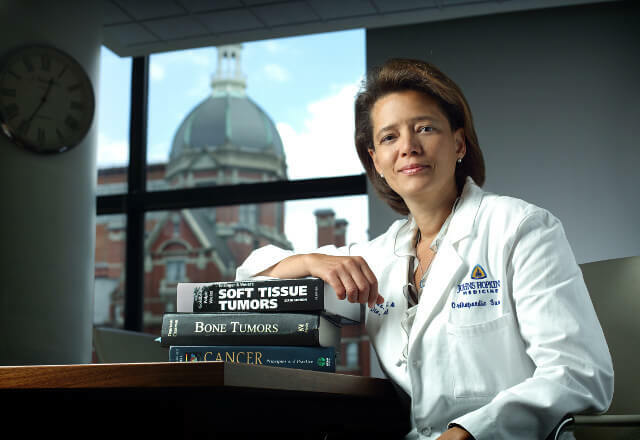 Dr. Carol Morris, co-director of the Sarcoma Program at the Johns Hopkins Sidney Kimmel Comprehensive Cancer Center, discusses sarcoma treatment options and prognosis. Dr. Carol Morris, division chief of orthopaedic oncology at Johns Hopkins, discusses how our multidisciplinary team diagnoses and treats children and adults with benign and malignant tumors of bone and soft tissues. Sarcomas, which are rare cancers found in the bone and soft tissue, require expert diagnosis and treatment. Drs. Carol Morris, Jonathan Forsberg and Adam Levin are members of a multidisciplinary team of experts who consult weekly to create a well-informed treatment plan for sarcoma patients through the Sarcoma Program at the Johns Hopkins Kimmel Comprehensive Cancer Center. The team includes both adult and pediatric medical oncologists, surgeons, pathologists, diagnostic radiologists and radiotherapists and plastic surgeons and offers a highly coordinated approach to care and treatment. Is the Skeleton Talking to the Body?